GOOD things always come in pairs; magpies, fish and chips, Tinker Hatfield’s Air Max 1 and Air Safari both dropping in ’87 — you know, those things. England-based-come-worldwide retailer, size?, decided to follow suit and release two of Nike’s most popular silhouettes, draped in an all safari get-up as part of a collection fittingly named ‘What The Safari?’. Size?, took it back to the company’s roots in terms of Nike collaborations — as you’ll see in my last article, they’re no stranger to the luxury sofa inspired decal. In 1987, Tinker Hatfield launched what would be one of his most successful and innovative projects to date. Encapsulating a visible Air unit within the sole of a shoe seemed far too ‘out there’ for other brands to consider, but when taking into consideration the building that Tinker took his inspiration from, it’s not hard to imagine why this idea seemed so perfect. This was more than Bill Bowerman’s waffle sole; well, perhaps not more but just as momentous. Being an architect, Hatfield would have been endlessly passionate about ground-breaking structures; down to the last intricate detail. The Parisian Georges Pompidou Centre, as Tinker says, is ‘spilling its guts to the world’ — and to be frank the building itself stands out like a sore thumb. Amongst brilliantly aesthetic and timeless French architecture, where does the modern, transparent Pompidou fit? It doesn’t. This is where Hatfield had his stroke of genius. ‘It changed the way people looked at buildings’, as he spoke admirably in a past interview; the air conditioning, heating and mechanisms of the building of the building are all visible. So, why not make the inside of a heel unit visible and share the inner workings with consumers? With details influenced by architecture, and an upper drawn from a sofa decal Hatfield once took a fancy to whilst shopping: this is a pair that truly reflects an urban safari. The home of street-culture. 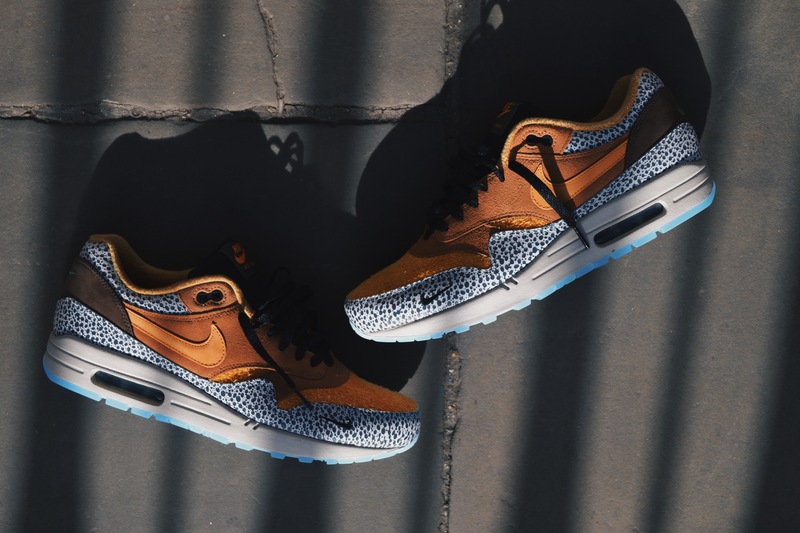 For those that have been involved in sneakers for a while, of course, an Air Max 1 ‘safari’ has been done before. We’ve seen Atmos cover base twice and even receive the retro treatment due to their original successes; but lets not forget Nike’s general release. This in honesty, didn’t take off in the manner of which they’d hoped. 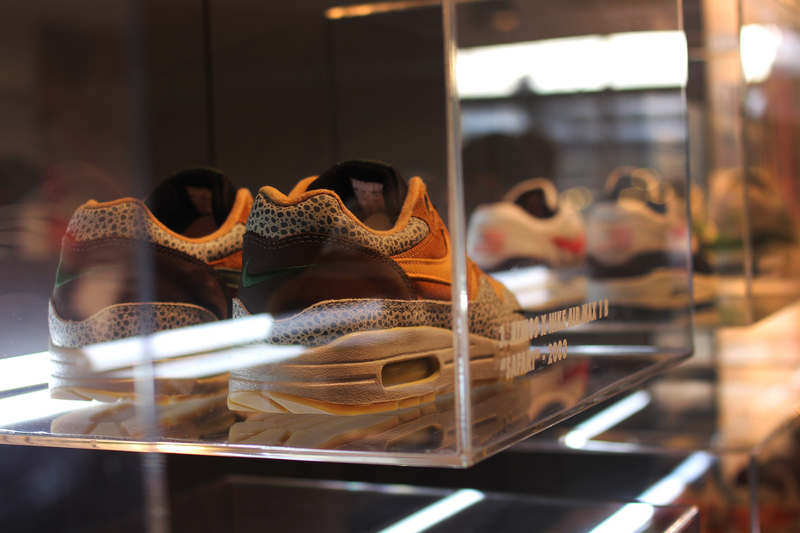 By all means it was a good safari capsule, but it wasn’t an Atmos Safari, was it? Atmos even used the same colour scheme that size? implemented — perhaps slightly lighter in tone, but in essence both pairs are very similar minus a few minor details which set them distinctly apart. First of all, colour blocking. Atmos’s original was infamous for its black on white, irregular polka dot panels spanning from heel to toe as well as lining the ankle padding. Instead of this, size? opted for a chocolate brown mud guard, side wall and heel cage — changing that previously crispy white shell. From here, size? 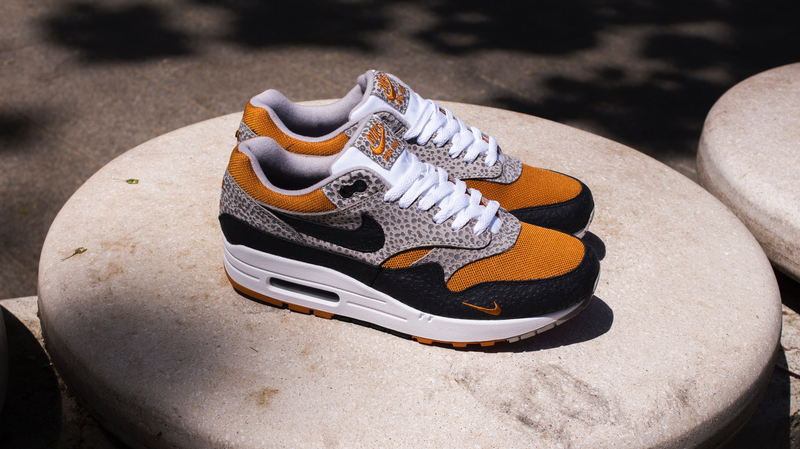 decided on a white tongue and lace combination ahead of black, another injection of safari on the swoosh and tongue patch; and lastly co-ordinating that ever-popular mini swoosh with the shoe’s ochre toe box, to complete a role-reversal on what we perceive the Air Max 1 Safari to be. 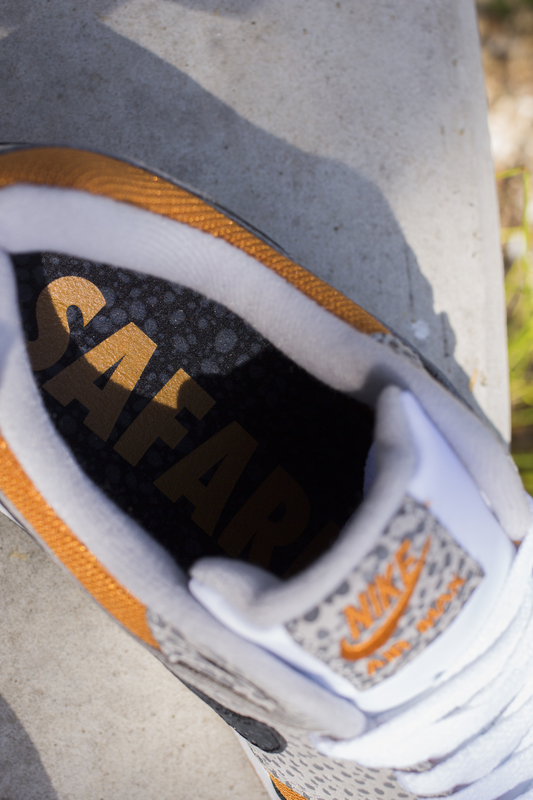 If they’re just another safari re-issue, why cop them? Well, this is the point that is being made; this isn’t just a re-issue. It’s an Air Safari in an Air Max 1 body. Nike have collaborated on a project with size? to encapsulate two of 1987’s landmark releases, this could even be seen as a testament to Tinker Hatfield and his most revolutionary year at Nike. Whether or not this was the intended story behind the shoe is yet to be announced, for that matter there’s an enormous possibility this concept is merely a mind at work. But, I’d like there to be a similar story behind a shoe. Just this one time. Next Third time lucky for the SK Air?